Pest control studies have indicated that the threat to health and safety from flying insects is greater than mice, cockroaches and rats combined. 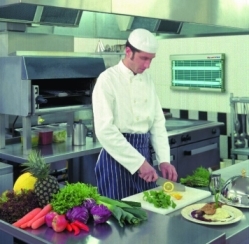 So whether you are operating a commercial enterprise, or need protection for your domestic kitchen, fly control is essential. PestControl.co.uk offer the highest quality fly killer methods, including EFK (Electronic Fly Killer) installation and servicing. Flies are extremely unsanitary creatures, able to carry a number of diseases (including Salmonella and E.coli) on their body and in their saliva. Only a small amount is needed for someone to catch a disease, so it is vital that pest control measures are taken against flying insects. High general hygiene standards. Flies are always looking for sources of food and water, and a regular cleaning regime will keep these to a minimum. Frequent disposal of refuse is also important, so that they cannot access old or mouldy food. Proofing. Denying flying insects access to your food preparation areas is also essential. There are a number of ways of doing this, and our pest control experts can advise you on the best options for your circumstances. These include window screens, door curtains and air curtains. Our pest control operatives can inspect your premises for signs of breeding areas, which will either be treated or eliminated. We also monitor your proofing situation to ensure that it continues to be effective. For any flying insects which do make it on to your premises, it's important to have fly control units which can deal with them safely and efficiently. We offer non-chemical control because areas which involve food handling or preparation should not be sprayed with insecticides. 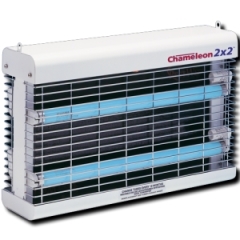 The fly control units we provide use UV (ultraviolet) light to attract flying insects towards them. Glue Units. At PestControl.co.uk we highly recommend using the sticky trap option. As the name suggests, this uses a board covered in glue and will hold the flies until they die. These boards should be changed regularly, and can be used as a record of pest control effectiveness, as well as evidence that due diligence has been carried out. Electronic Fly Killers (EFK). When flies come in to contact with an EFK a high voltage running through them kills them instantly, and they should then fall in to a tray beneath. However the reason these are not recommended by PestControl.co.uk is that in some cases the shock can cause the fly to 'bounce' away from the tray and end up in the food preparation area. Our pest control technicians will be able to place the fly control units correctly so that there is as little interference as possible from other light sources (enabling the attracting UV light to work at its best), and in areas that will attract flies. It is also important not to place them directly above areas where food is stored or prepared. Regular inspections will also ensure that the pest control strategies continue to work effectively.